This is a great little tool for using in environments where you’re required to work with sensitive data. The biometrics in the device behave flawlessly (having heard about some other less-than-impressive implementations of fingerprint recognition technology, I had been a little worried that this item would be one of those that had lots of ‘false negatives’, but I needn’t have worried – it does what it’s designed to do, and it does it every time). The drive itself is sturdy, small and absolutely silent in operation. It doesn’t heat up in the slightest, and the rubber feet and chunky construction mean that it sits steadily on whichever surface you put it on, so you can use the fingerprint reader with one hand, without having to use your other hand to steady the unit. It also comes with a power adapter (which, admittedly, looks a little flimsy and makeshift once you plug the UK adapter into the two-pronged US-format base unit). On my PC and laptop, the power adapter wasn’t needed anyway, provided I plugged it straight into a USB port (it wouldn’t work on its own through an unpowered USB hub). For £40, I think the fact that it comes packaged with an adapter at all is pretty impressive; many of the more expensive drives I’ve bought have had adapter sockets, but haven’t come with an adapter unit. The pre-loaded software works seamlessly in Windows 7, and is well thought-out. You just plug the unit in, and a new drive appears in your list that contains the start.exe programme you need to get going. Double-clicking on start.exe guides you through the simple (less than one minute) process of registering two fingerprints and setting you up to use the drive. You choose an administrator password during that initial setup (which you can use to access the drive should the biometrics fail at any point, or should you be in a position where you can’t physically access the drive but still want to unlock it; e.g., if you’re using VPN to access a PC it’s connected to). After that initial setup, it’s just a matter of plugging the drive into whichever PC you want to use it on, swiping your finger once over the reader, and you’re good to go. 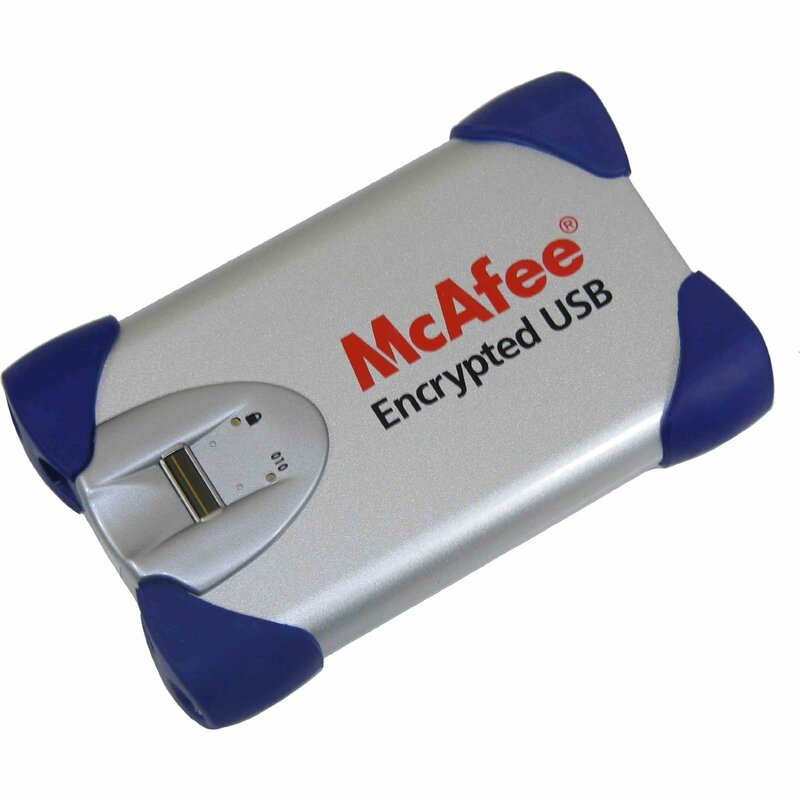 My only slight quibble is the ugly, branded “McAfee” logo that’s been plastered over the top of the drive! It’s hideous!! If you want to, you can remove this eyesore easily enough with the edge of a coin, just like using a scratch card, without damaging the underlying silver paint. To avoid any mess as the little flecks of powder-coat paint re-adhere themselves to the silver case after rubbing off the logo, I recommend covering the logo with ordinary, clear sellotape first, then rubbing gently over the tape with the edge of a coin, then peeling back the tape to remove the logo (which adheres neatly to the tape and comes off cleanly in one piece rather than turning into thousands of individual sticky dust particles). In terms of transfer speed, the on-the-fly encryption used is just about noticeable. The transfer speed I saw on large ( > 6Gb) files was around 10Mb/s. My unencrypted SATA II drive manages around 40Mb/s by comparison. This was still a good enough performance for me, and compared favourably with the SSD + TrueCrypt Traveller Disk arrangement I had been using prior to this purchase. All in all, minor quibbles aside, this is easily the best bargain I’ve seen in a while. £40 for a reliable 120Gb biometric drive that has reasonable transfer speed is simply superb value. I recommend this item for anyone that’s serious about security, but who doesn’t want to have the hassle of setting up TrueCrypt/Bitlocker etc, or remembering passwords, whilst moving data around.